Best Options: Take Bus 918 at the Dongzhimen - Eastern Train Stations Bus Terminal to arrive at the Main Bus Station in Pinggu. At Pinggu Bus Station change to Bus Line 9 to Jiangjunguan & Great Wall. Jiangjun Guan Great Wall location coordinates: 40°16′60″ North 117°20′60″ East. The JiangjunGuan Great Wall of China location is the Most Eastern Great Wall Site within Beijing City Province and is located in the small North-Eastern Pinggu District, one of the Four Rural Districts of Beijing. 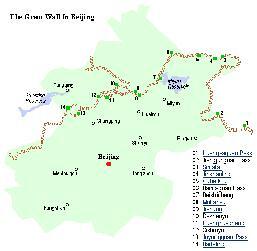 The distance from Central Beijing to Jiangjun Guan Great Wall is about 99 kilometers. This section of the Wall lies 69 Kilometers due North-East of Capital International Airport at Shunyi Village & District of Beijing. Jiangjunguan boast the only section of the Great Wall of China constructed exclusively of natural rocks. To the West of Jiangjun Guan Wall lie first Simatai, then follow Jinshanling and Gubeikou sites of the Great Wall of China. Eastward, lies Hebei Province where the next site of The Great Wall of China is Huangyaguan, or Yellow Cliff Great Wall. Jiangjunguan is a small Village named after its pass on the Great Wall, the "Generals Barrier". The Village has a new section, north of which lies the old Village outside and North of which lies the Great Wall of China Gate Pass. The Jiangjunguan Great Wall sections have very steep inclines which wind along unrestored among wooded hillsides. The climb out above the valley floor offers Spectacular views of Granite Mountain Tops and the path of the Great Wall and ruins. Nearby are steep Red Stone Cliffs. The largely unrestored wall can be tough to climb. At some places it near disappears from sight, making for a truely Wild Hike on the Great Wall. Apart from the pathway of the Great Wall there are many trails crisscrossing the forests and small patches of land. Dotted around the steep cliffs lie hidden mining sites used in small scale mining. When out Hiking, especially when alone Beware of Dogs, China has alrge rural stretches in which large guard dogs make their territories, they may roam free with unpredictable behavior. Furthermore, dogs in Rural China regularly contract rabies, making a biting incident potentially life-threatening. Nearby the Great Wall at Jiangjunguan there is an abundance of Small Farms and the stunningly new Jiangjunguan New Village and its solar-panel-topped villas. Other noteworthy attractions of the Jiangjunguan Area are an abandonned nearby gold mine, the river and nearby Jinhai Hu(=Lake). Travel by car or bus to nearby Jingdong Grand Canyon where one can catch the views of beautiful mountain scenery, forests and the Jindong Canyon. Not far from Jingdong Grand Canyon lies Yuzishan, an old village that served as a battlefield during 1936 AD Japanese Invasion in what in China is known as the War of Resistance Against Japanese Aggression. Between May and Juli it is cherry picking season in the village, making for an extra sweet stay. The annual Pinggu International Peach Blossom Festival lasts to mid-May. During this season, Pinggu District is covered with colourful peach blossoms. Pinggu Town and immediate area ranks No.1 among the very best places to view the sea of flowers. A Full Google Earth Supported Map of JiangjunGuan Great Wall by Google.com. 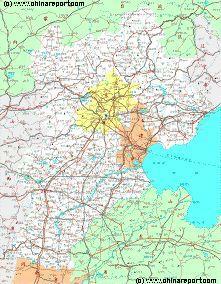 Adjacent Map gives direct access to JiangjunGuan Wall Map by Google. Map of Beijing City Province and ALL Locations of The Great Wall of China visitable within Beijing City Province and Immediate Vicinity. 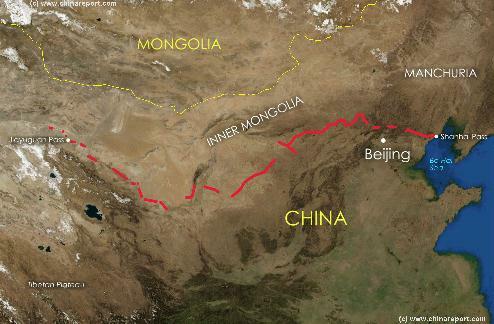 A Geographic Map overview of North-East China's Hebei Province entire, delineating Hebei Provincial Borders, Beijing City Province, Tianjin City Province and parts of neighboring Shanxi-, LiaoNing- and Shandong Provinces and Inner Mongolia AR. Map includes Great Wall of China Locations in Hebei Province, Main Cities and Towns (shown by size), Hebei Province Monuments, Main Mountains (with Height), major highways, railroads, waterways, and Airports (National & International) and links to furher information. launched a contest for the best and most "green" and environmentally friendly designs and approaches in 2005. The result is the flashing new appartment blocks that can be seen today designed by Prize Winners: Fang Ming, Dong Yanfang, Zhao Hui, Zhao Jian, Yang Meng, Wang Yu, Xue Yufeng. The first wall built at JiangjunGuan dates from the 6Th Century Northern Qi Dynasty. Its Wall was modest in comparison, built of clay and brick. The defenses were then upgraded with beacon towers and watchtowers during the Sui Dynasty (589 AD - 618 AD) and the Ming Dynasty. The Jiangjun Guan Great Wall was the only section of the entire Great Wall of China to be constructed of Natural Rock or Stone during the early years of the Ming Dynasty Era (1368 AD - 1644 AD). of the Ming Dynasty), General Qi Jiguan added watch towers and other defensive works to the Great Wall at Yellow Cliff as well further West to the Jinshanling Great Wall (Hebei Province). The Jiangjun Pass was the Generals' Favorite section due to its supposedly impenetrable solid natural rock construction, hence the name: Generals' Barrier. in 1679 AD in the beginning years of the Qing Dynasty (1644 AD - 1911 AD) the Pinggu District was hit by a Magnitutude 8 sized earthquake, damaging sections of the Great Wall. In 1976 AD another 7.8 Magnitude Quake struck nearby Tangshan with unknown results for the Great Wall of China in the Region but around 250.000 people lost their lives in the earthquake itself. In 1933 AD The Jiangjun Guan Great Wall Pass was one of the passes attacked by Japanese Forces bent on penetrating south into Hebei Province and towards the northern Capital of Beiping (as Beijing was called at the Time). Most recently in 2006 a reconstruction of the Jiangjunguan Great Wall was constructed by local entrepreneurs in the hope of attracting more tourist. The project backfired when volunteers of the Great Wall preservation organization found the imitation wall sections during one of their hiking trips. Without hesitation reporting their findings to the Beijing Municipal Administration of Cultural Heritage the copy-cat wall section was torn down. Inside the new Village is a small main shopping road where one can find a large restaurant and several small shops selling daily use items, snacks and the like. The Old Village lies due North of of New JiangjunGuan after which follows the actuall Pass Gate on the Great Wall of China. The Gate Entrance has been lost, however to the East and West The Great Wall of China climbs the steep sides of this deep mountain valley. The village itself has been promoted to Scenic Folklore Village Status, turning it into somewhat of a tourist trap with so called traditional performances. Off season much of the local charm and pace of life remain however. Rough: Lat (DMS) 40° 16' 60N Long (DMS) 117° 20' 60 East. Altitude: 622 Meters (2043 Feet). 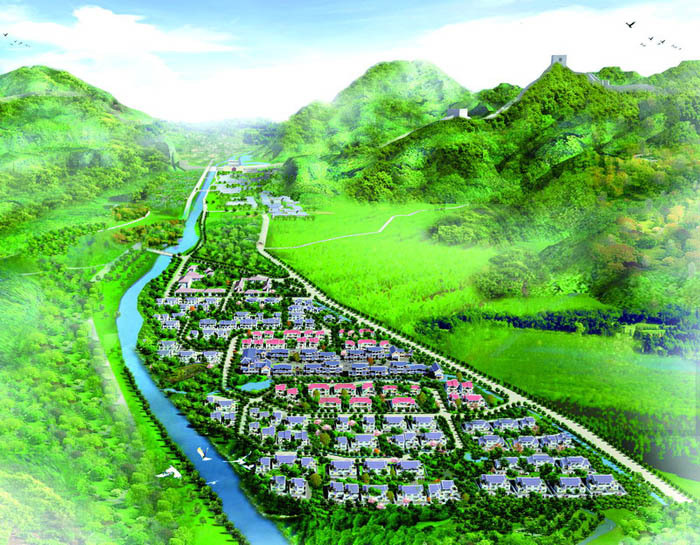 Artist Impression of new Jiangjunguan Village, the Valley and its Great Wall of China. 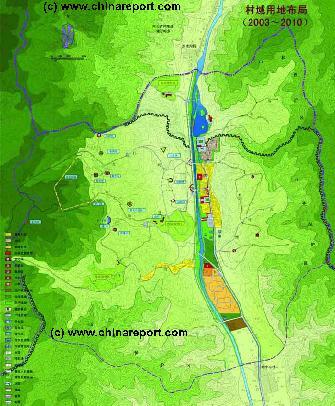 Overview Map of Jiangjunguan New Village, Old Town Area and the Great Wall of China at Jiangjunguan Pass.